Tens of excited foreigners gathered in the courtyard to make kimchi with Korean volunteers. 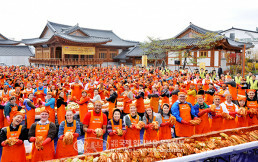 At the Suwon Traditional Culture Center, which is surrounded by small and classical traditional Korean houses, the 14th Kimchi-Making Festival to Share Mother’s Love was held by the Intl. 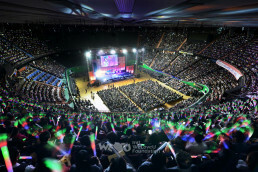 WeLoveU Foundation. 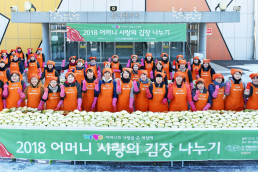 It is already the 14th kimchi-making festival to help neighbors get through winter. 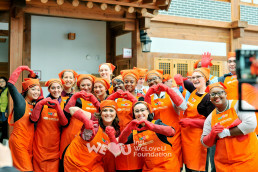 At this event which was held from 10 a.m. on Nov. 14, Chairwoman of the WeLoveU Foundation Zahng Gil-jah and more than 300 members rolled up their sleeves to make kimchi. 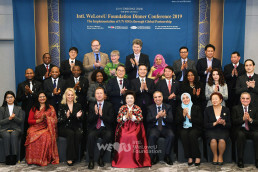 Chairwoman Zahng Gil-jah explained the purpose of the event: “Kimchi is very important in Korea for winter food. Every year, we make kimchi with love, and deliver it to our neighbors who are having hard times. We hope that they will cheer up though life is tough since we are with them.” About forty foreigners living in Korea, housewives from multicultural families, and foreign tourists visiting Korea who agreed with the aim of the event, too, participated in this event; it was a good opportunity to let the world know Korean culture of making kimchi for winter. Although rain was forecast all day long, it was partly cloudy and mild throughout the event. As soon as kimchi was made and packed, raindrops started to fall as if they had been waiting for the moment. In the afternoon, Chairwoman Zahng Gil-jah and her company delivered freshly made kimchi to neighbors despite occasional rain. 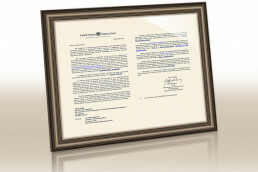 They visited an elderly husband and wife in their 70s, who have put their relative who fell from a stroke on their family register as their foster son despite difficulties; an aged lady who is ill and lives alone in a small room; and an aged gentleman who lives alone and grinds food in the blender as he has no teeth. 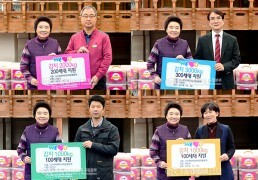 Chairwoman Zahng Gil-jah encouraged them, “I heard this winter will be very cold. Please stay warm and healthy, having kimchi our members made sincerely,” and presented kimchi, rice, side dishes, daily necessities, and heating expenses. Serene smiles spread over wrinkled faces of these elderly beneficiaries as they received love and care contained in kimchi. Kimchi-making is a culture of helping and sharing. The love of a mother, which is shared through kimchi, delivers happiness and hope for life to our neighbors, and cultures of volunteer services and sharing to the world.